Rice fields are synonymous with Bali — so much so that a visit to the island paradise is incomplete without having walked along their glistening terraces. 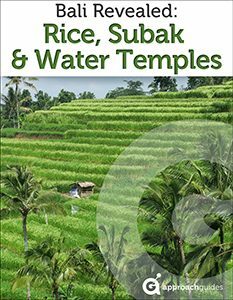 This guidebook explores Bali’s rice-growing tradition, explaining the 1000-year-old subak irrigation system that supports widespread agriculture and the sacred water temples that nurture and reinforce the cosmological belief in tri hita karana underpinning the whole system. This guidebook helps you get the most from your visit. With high-resolution images and insights available nowhere else, it is an invaluable companion for understanding Bali’s rice fields and, perhaps more important, tapping into what make the place like nowhere else. Create your own itinerary with our map and ranking of Bali’s water temples.